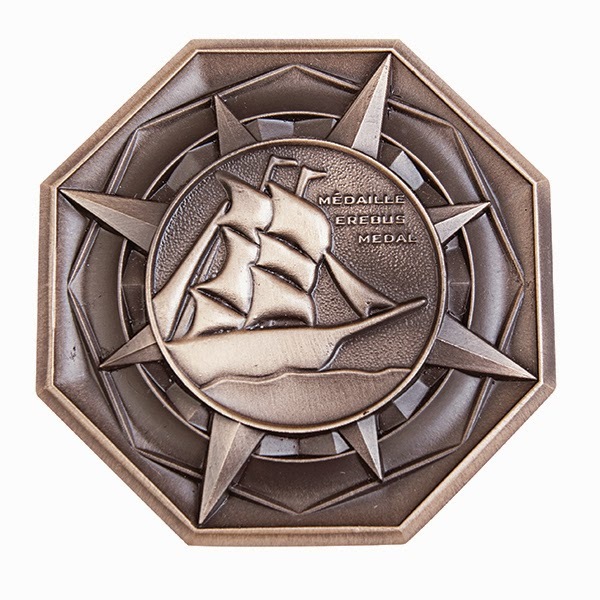 It's a handsome design, with elements -- such as the octagonal edge -- from the British Polar Medal, and others, such as the tilted compass rose, that draw from the Victoria Strait Expedition patch. The "Erebus Medal," as it's called, was awarded by the Royal Canadian Geographical Society at a special ceremony yesterday at the Royal Ontario Museum, with Prime Minister Stephen Harper (a recipient) and other dignitaries in attendance. There are two hundred and twenty recipients in all -- a remarkable number -- with the announced intent of recognizing everyone involved in the 2014 search and the work that made it possible. In that light, of course, it recognizes the crews, the dive team (led by Bernier and Harris), and support staff, along with Doug Stenton and the helicopter pilot whose discovery of ship's remains on land helped point the way to the final discovery. It also recognizes key figures without whom this discovery would never have been possible, such as David C. Woodman -- the first to compile, analyze, and trust the record of Inuit testimony -- and Gjoa Haven resident Louie Kamookak, who has helped guide searchers for many years. And yet the omissions from the list are (in my view) a bit glaring: where is Robert Grenier, who led the very first of the Parks Canada searches? Where are the archaeologists who did pioneering work analyzing Franklin sites, such as Margaret Bertulli, Anne Keenleyside, and John MacDonald? Where are early searchers such as Bob Pilot, Stu Hodgson, the late Barry Ranford, or John Harrington? Why are -- besides the environment minister -- Louie, geographer Caitlyn Baikie, and Peter Taptuna the only Inuit recognized? And then of course there are scholars, us humble blokes -- I was happy to see Shelagh Grant's name, but where are the many others whose research over the past decades has given us new insights into the Franklin search? Of course, as with any award, there will always be some who are unhappy about those who did -- or didn't -- receive it. It's not quite clear, though, exactly what criteria the RCGS used -- did the recipients have to be living? Did they have to be Canadian? Will there be additional medal recipients in the future? Finally, while there is certainly much to celebrate, there's still a great deal to be done, starting with locating the wreck of the "Terror" and continuing through the just-announced April dive, and many dives to come. And, as I've noted frequently on this blog, there are still some sites on land -- particularly the Todd Islets and Starvation Cove -- which are sorely in need of modern archaeological study; the ships can only tell us the tale of what happened before they were abandoned, and Franklin's men may well have struggled on for many months, or years, after that. That said, congratulations to all of the recipients are in order -- it's certainly a great honor. I certainly echo your sentiments, Russell. I have heard back from the person I contacted at the RCGS that there was no requirement that recipients be Canadian, and that all those who received it are living (without specifying whether that was a requirement). Also, that this is a one-time medal that will not be awarded again. Ice Diving on HMS "Erebus"